Bathrooms become the unwitting hub of our homes. They are used by every member of the household and are high traffic areas. We tend to overlook the small details when we think about our bathrooms. Things like the bath, shower and sink often look lovely and we choose tiles based on price and practicality. However, there are options out there that can lift your bathroom up to a new level. 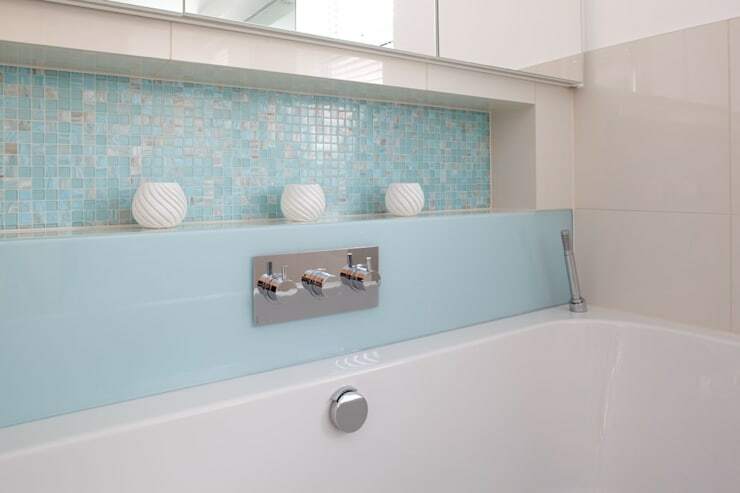 Using glass tiles as a decorative tool can be as cheap or as expensive as you like. They are designed in various sizes, shapes and patterns so you can truly make something unique. You can make it personal as well as practical and affordable. Take a look below for some inspirational ideas. This has a very natural feel to it. From the wooded tops and cabinets to the stone sinks. The individual look creates something very unique and welcoming. The tones in the room are muted to keep in line with the overall design of the bathroom. The monolithic stone adds a feeling of bringing the outside into this room, whilst the wood underneath it softens the overall feel. 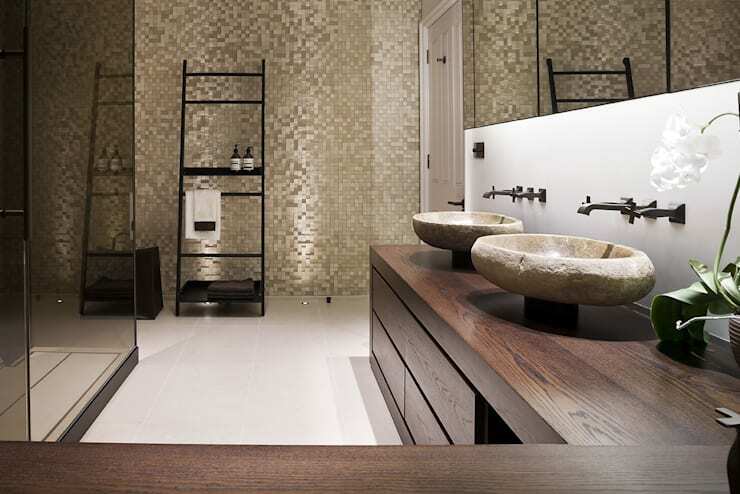 The use of glass mosaic tiles offer a tone of elegance to the space. They shimmer and shine, as well as reflecting light and give the room a luxurious feel. Glass doesn't always have to be in a tile format. 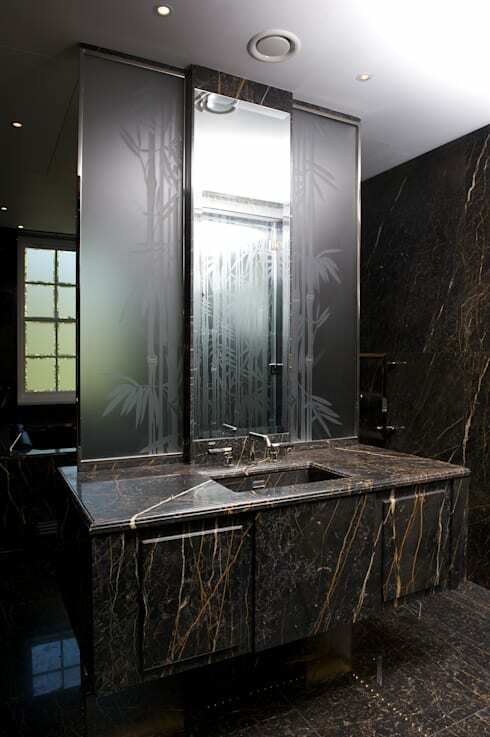 Lucy Batt has created a lovely effect in this bathroom using etched glass. Sandblasting and carving techniques are also used by the artist to create bespoke and beautiful pieces. 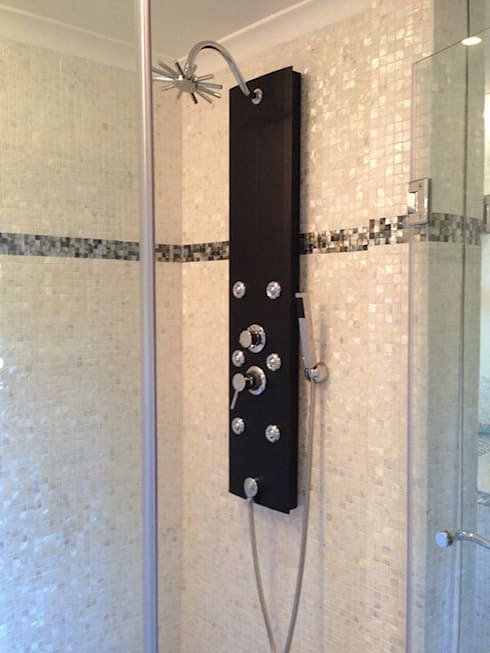 The effect can be used on shower screens, doors, or as a wall piece, as in this image. The work offers a feeling of depth and makes any bathroom feel alive. Tiles really can create any feeling you want from them. In this ensuite, you can see the tiles in the shower contrast the rest of the walls and floor. 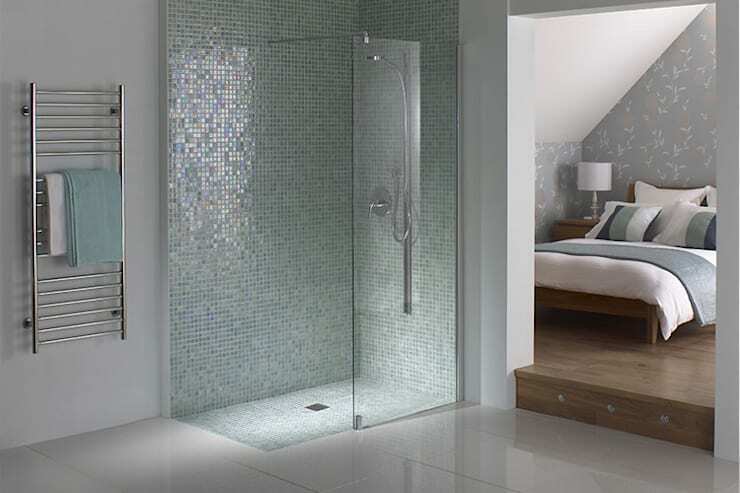 The marine colours fit well with the shower space and the element of water. They separate the shower as well, making the room feel like it has a bit of edge. 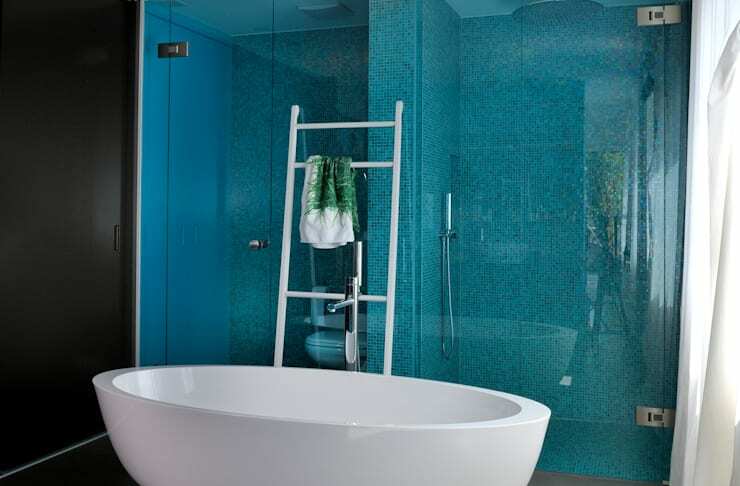 The colours are indicative of the sea, blues and greens, creating a warm and relaxing space to wash in. 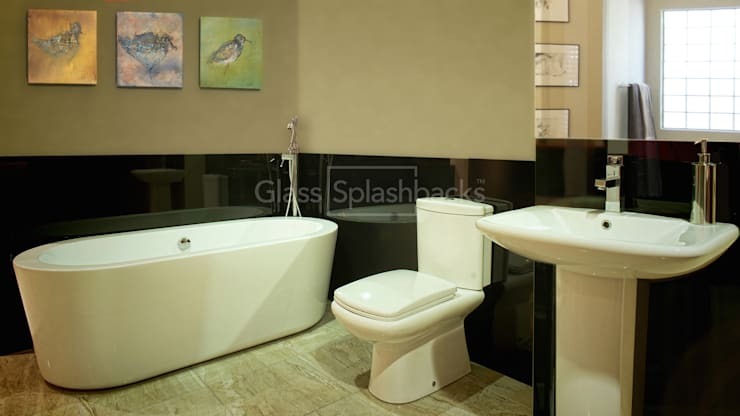 In this bathroom, the design has gone with glass spashbacks. It gives the feeling of Art Deco and the 1920s with the black and white used here. The glossy glass around the walls feels classic and beautiful. It looks modern, yet old fashioned all at the same time. The glass is easy to clean, making it a very good effect to have in any bathroom. Glass can be cut to fit around anything, so no matter how your room is laid out, a splashback can be customised to fit. On this particular Splashback you can customise the colour, shape and even have an image on it. You don't have to tile a big portion of your bathroom to make it look good. This room tiled a small section with iridescent glass to make the room feel a little different. Sometimes small changes make the biggest differences. Just tiling one small section and then using the colours of it to accentuate your bathroom can really lift the face of it at a very small cost. In a fairly darkly tiled room, you would think using lighter glass tiles would suit it better and offer up more light. But as you can see here the dark floor and wall tiles are still contrasted by the purple tiles and mirrors. 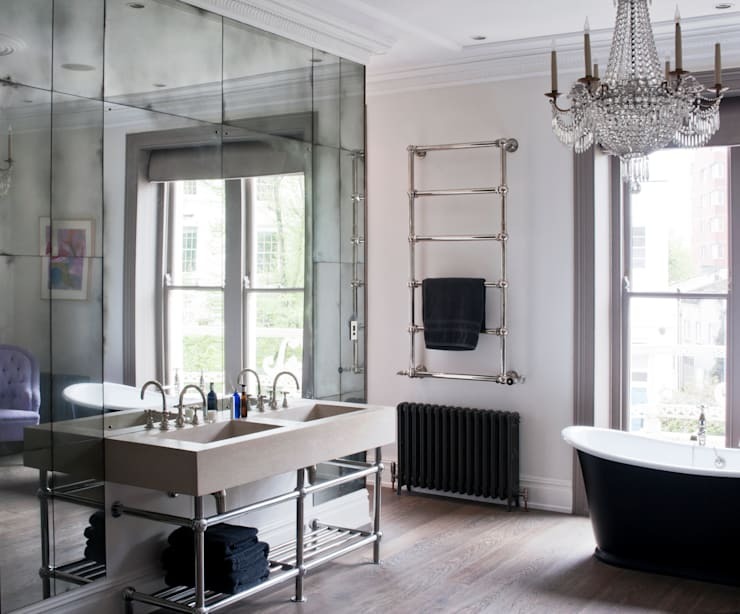 The two large mirrors reflect light really well around the bathroom, not to mention the fact that the big window offers lots of natural light. 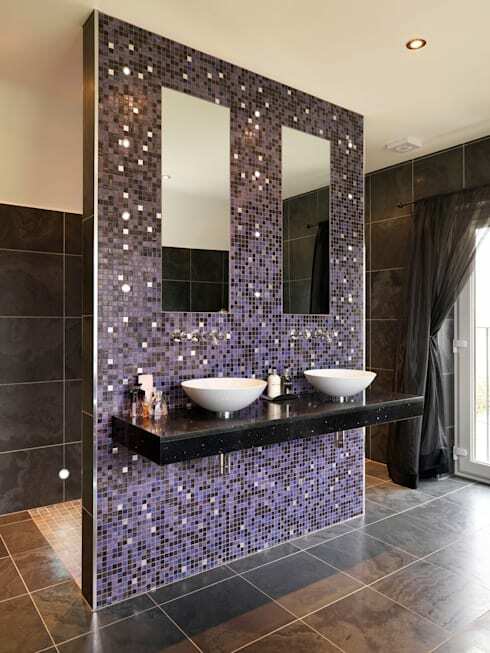 The tiles are not all purple, there are darker shades and small mirrored tiles too. Offering a shimmering effect that helps bounce light around the room. Bathrooms can look plain and dull at times. Here you can see pretty standard wall tiles that are neither 'wow' or standout. The sink is white too and doesn't make the bathroom anything special. The mosaic tiles, however, offer themselves as the star of the show. The bring a sense of colour to the room and you can coordinate other decorative items around them. The wall tiles and sink now feel part of something special. Too much colour can be overkill, but the balance here is perfect. Using extremely small tiles can create a really amazing effect. The blues and torquise shades used here could be construed as cold in any other room However, in a bathroom they don't feel cold at all. What they resemble is calm, water and a sense of space and cleanliness. 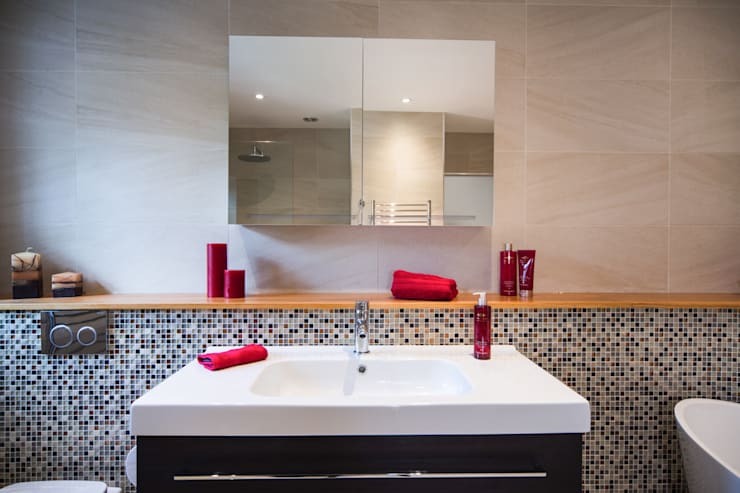 This is a modern bathroom using the traditional technique of mosaic tiling. The shower screen being glass really helps give the feeling of openness in this room and shows off the tiles very well. Shower are a place you can spend ages just day dreaming of far away lands or just getting lost in your own thoughts. The tiles here offer a look of calm and serenity to help with that. The pearl effect of these tiles means they shine beautifully in the light. The shower unit itself is black and contrasts the tiles very well, whilst still tying in with the darker band of mosaic tiles around the middle. There is definitely and antique feel about this whole room. From the chandelier to the bath. But the main feature here is the glass wall that reflects all the light and bounces it back into the room. It is a whole glass wall that you just can't miss. The sink is modern, yet the classic style of it means it fits in here perfectly. The tiled glass on the wall is simply stunning and makes the room feel incredibly open. A lovely blend of modern and classic in this room give it a very sophisticated feel.